Not so long ago, on an internet discussion forum not so very far away, there was a lighthearted running discussion entitled “You Know You’ve Been Studying Irish Too Long When…”. Oideas Gael, for learning Irish in Donegal, Ireland. OK, I admit it. I’m the one who made that post. And it didn’t take me all that long to get to that point, either. In fact, I started dreaming of attending a course at Oideas Gael very shortly after I started learning Irish in 2004. In the summer of 2008, that dream came true when some internet friends of mine (fellow musicians) proposed a trip to Ireland. I waffled about the expense, but my husband said “you should go” (he’s a keeper! ), so off I went! And that’s where this story begins. After a week in County Clare making music and exploring the Burren, I set off with a couple of friends to pursue the dream in the Donegal Gaeltacht. 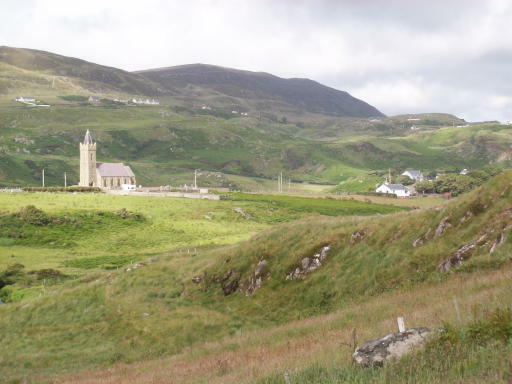 I’ll never forget coming over the hill into Glencolmcille for the first time. The pictures just don’t do it justice. Even in a driving rainstorm, it has to be one of the most heartbreakingly beautiful places on earth. 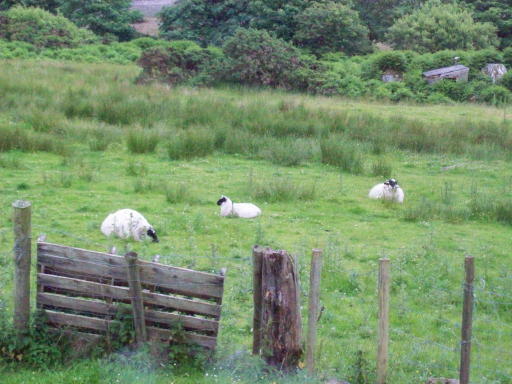 Looking down the glen from Oideas Gael. And yes, Virginia…there really are 40 shades of green (at least!). If you visit, do plan to leave your camera behind occasionally. Otherwise you can get so caught up in taking pictures that you miss out on the place itself (that’s the voice of experience talking). The town Oideas Gael calls home (which is actually called “Cashel.” “Glencolmcille” is the parish) is a very typical Irish village — homes, churches, shops, pubs, etc., all clustered around a main road, with just a few side roads. It’s a small place (you can walk from one end to the other in about 20 minutes), which makes things very convenient. There’s quite a bit packed into that little space, however. Oideas Gael is located near one end of the village, just a short walk from the beach, in a two-story building owned by Foras Chultúir Uladh (The Ulster Cultural Institute). In addition to classrooms, the building features a bookstore (which also offers CDs, cards, and gift items as Gaeilge) and a restaurant, An Chistin (“The Kitchen”), which, by the way, makes some of the best chips I’ve ever eaten. Other places of interest in or near the village include a folk village (which has a very nice gift shop), a woolens shop, two small food shops, a couple of restaurants, a post office, two churches, and (as of this writing) two pubs*. 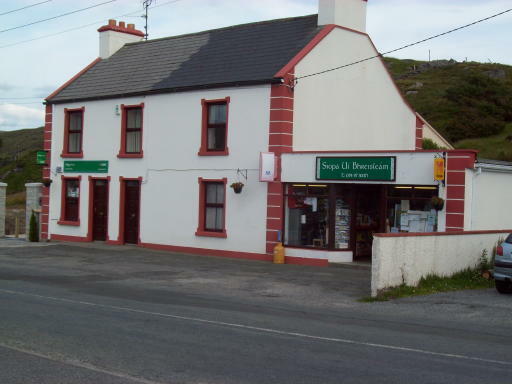 Travelers should take note that there are two things you might take for granted that the village doesn’t have: An ATM and a pharmacy (called a “chemist” in Ireland). As far as the ATM goes, you can, of course, always use a credit or debit card in the shops. With the fees banks charge for changing between currencies, however, it really makes sense to bring enough cash with you to get through the first several days. Once the week gets started, the office can hook you up with others who need to make a trip to the nearest town with an ATM, if you need it. Regarding medication, it goes without saying that you should bring any prescription meds you need for the duration of your visit with you. That’s really international travel 101. As far as OTC meds go, the two food shops in town carry a limited range of over-the-counter medications, but if there’s something you really rely on (in my case, diphenhyramine — aka “sleepy” Benedryl), you’ll want to bring enough with you for your entire visit. Don’t make the mistake of thinking that OTC meds that are readily available in the U.S. are equally readily available in Ireland (or in any country). If you really need it, bring enough to see you through. * Right before this article was written, I found that one of the three pubs from my time there had closed. RIP, Biddy’s! 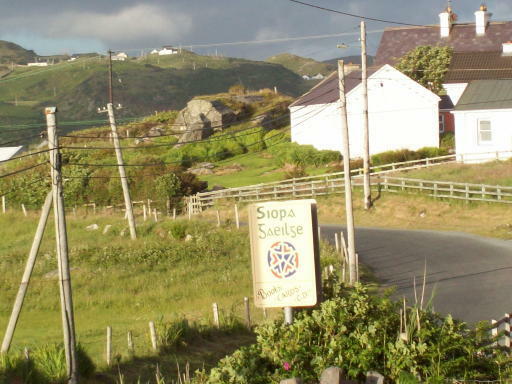 One very nice thing about Glencolmcille is that people are much less reticent about speaking Irish with outsiders than is the case in some other Gaeltacht areas. I assume that the presence of Oideas Gael there has a lot to do with it. I came half expecting to be rebuffed by the locals as I fumbled through my cúpla focal, and was pleased to find that people were very willing to speak Irish with me. That’s really a major plus, as getting your nerve up to actually USE the language you’re learning can be a challenge for just about anyone. Speaking in the classroom is one thing — it’s a sheltered and supportive environment — but speaking in the outside world can be frightening, and it’s really nice when people are helpful and tolerant. And, of course, the people at the school itself are just plain wonderful! You won’t find a more supportive and friendly atmosphere for learning Irish anywhere. They really want you to succeed, and to have a good time while doing it, and it shows. It’s not long before even the shyest newcomer is relaxed and having fun. View from our sitting room window, week one of the Irish language course. Lodging options arranged by Oideas Gael (which include self-catering and B&B-type situations) are mostly within easy walking distance of the school. We chose the “Self-Catering B” option, which places students in houses in the village. During our first week we were in a cute little house about 15 minutes’ walk from the school, near the protestant (Church of Ireland) church (that’s the beautiful stone church you see in some of the pictures on the Oideas Gael website). It was a pleasant and comfortable house, with a beautiful view of the pastures and hills surrounding the village, but we wanted to be a bit closer, so asked if we could move for the following week. 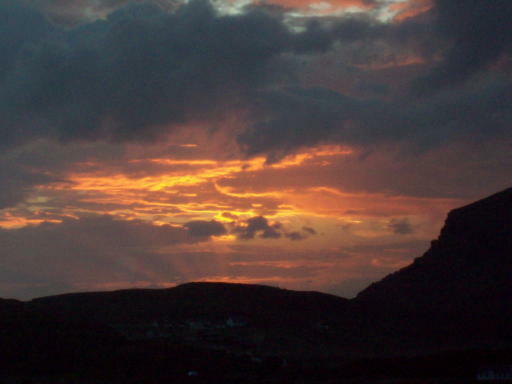 Sunset from our front yard during week two of the Irish language course. Of course, you’re free to make your own lodging arrangements if you wish. 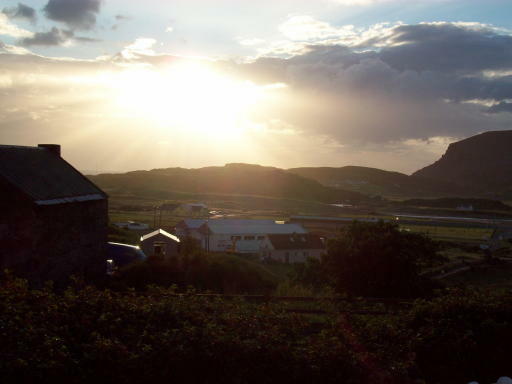 There are quite a few B&Bs in the area, as well as a couple of hotels and a hostel. It’s still good to get input from the school, however, especially if you won’t have access to a car during your stay (we didn’t)…otherwise you could find yourself faced with quite a hike several times a day! For myself, as a fairly independent introvert, I found the self-catering option gave me just the right mixture of social opportunities and autonomy. The thing is, “hard” is the wrong word. You learn a lot in these classes, but there’s no drudgery involved. Far from it. In fact, students are actually advised not to go overboard with taking notes. The classes are conversationally based, and the idea is to experience the language and to absorb it in an immersion environment. How this works varies from teacher to teacher, but one thing that doesn’t vary is that the classes are fun, interesting, and absorbing. It’s amazing, really, how quickly the time flies. Break time will be announced, and you’ll think “but we just started…!” only to realize that a couple of hours have passed. That said, it pays to remember that, no matter how much fun you’re having, your brain is putting in a lot of work. That’s one reason the breaks between classes are so important. You really do need them, to help you assimilate what you’re learning. I slept like a dead thing every night I was there (the evenings in the pubs may have had something to do with that! ), and often woke up with Irish and English doing a two-handed reel in my mind! Saturday: New students arrive, get settled into their lodgings, and begin to explore the village. 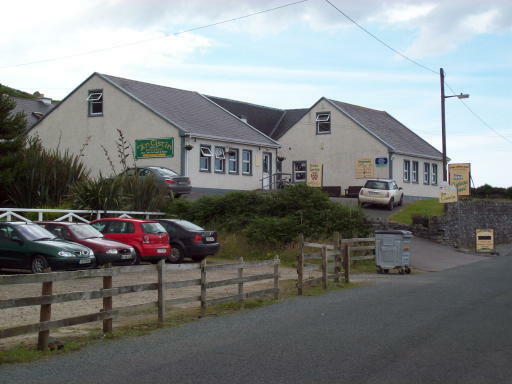 There’s a mandatory meeting on Saturday evening for new arrivals so that director Liam Ó Cuinneagáin can make sure everyone has accommodations and knows a little bit about services available in the village. You only need to attend this meeting once, so if you’re staying more than one week, the following Saturdays are good days to organize sightseeing or shopping expeditions. Classes start on Sunday afternoon after lunch. First there’s a general meeting to help you get sorted into the level that’s right for you. Don’t worry if you’re not sure how to place your own ability. Liam and the teachers are wizards at helping you determine which level is best for you to start in. Trust their judgement and give it a try, even if they seem to think you’re more advanced than YOU believe yourself to be. Chances are they’re right. Adult learners have a real tendency to under-estimate their abilities, and you don’t want to let an excess of modesty get in the way of your learning! Don’t be afraid to push yourself a bit. That’s what you’re there for. Of course, you’re always free to change your level during the week, if you really feel you’re being over- or under-challenged (just talk to your teacher). The first class starts right after this meeting, and goes until dinner time, with a short break for tea halfway through (and if you’re an absolute beginner, don’t worry…you WILL be able to ask for your tea or coffee in Irish before the break!). Monday through Friday: Regular schedule. Classes start at 10:00 a.m. and go until lunch, with a tea break halfway through. There’s a nice long break for lunch (about two hours, as I recall), then classes resume for the afternoon and continue until 5:00, once again, with a break halfway through. These breaks really are important. They give you an opportunity to try your new language skills with your fellow students, as well as some “head time” to absorb what you’re learning (not to mention time to browse the bookshop!). In the evenings, usually starting around 9:00, there are optional fun activities. Some that were available when we were there included céilí dancing, singing, poetry readings, short films, and hill walking…all as Gaeilge, of course! On Friday evening, there is a “talent show,” with each class presenting something. These can be very creative (my first week there the level ones showed off what they’d learned by involving everyone in a game of charades) and are always a lot of fun. Oh, and don’t worry that you won’t have time to experience the local pub culture. I was surprised to find that scheduled musicians didn’t get started in the pubs much before 11:00 p.m.
You’ll find, actually, that a good many of your classmates (and teachers!) put a cap on the evening by walking down to one of the pubs after the evening activities. No matter how long you stay at Oideas Gael, you’ll be shocked at how quickly the time flies by. I found myself waiting for the bus to Dublin two weeks after my arrival wondering how in the heck the time had gone by so quickly (and busily plotting my return!). If you’re serious about learning Irish, this really is the ultimate vacation. You’ll learn a lot, you’ll make friends, and you’ll find your resolve to master the language strengthened and supported. Come to think of it, I’m overdue for another visit…. Are you considering a visit to Oideas Gael? 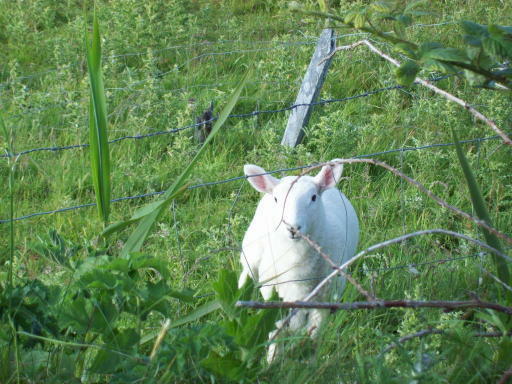 Uain – a lamb (don’t forget they only speak Gaeilge). If you’re considering a visit to Oideas Gael, or if you have any questions about immersion experiences, feel free to ask your questions below. We’ll do our best to help you out! P.S. Audrey went back to Oideas Gael the following year, read that in her Donegal Diaries. “Gleanncolmcille Is ceantar álainn é seo”. Nice photos in the post Audrey. Thank you. I live about 90 miles from Tír chonnell but have never been to that beautiful glen. Shame on me. I hope to go there next year if not earlier. 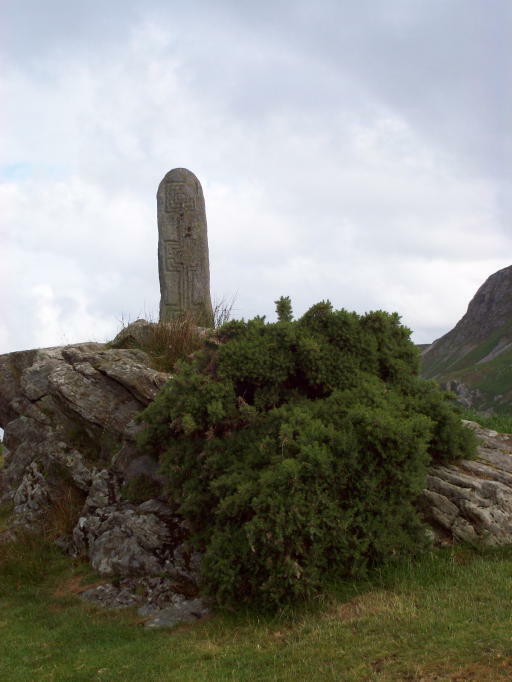 I’am attracted by the hillwalking and the chance to improve my Irish. Slán, Pádraig. Is áit iontach álainn í, cinnte! Glad you like the pictures…I must have taken thousands! (Thank God for digital photography, or I would have been bankrupted developing film!) Ireland is an incredibly photogenic country just about anywhere you go, but Gleann is just amazing in that respect…rain or shine, the play of light on the hills and the sea always seems to beckon you to “take just one more!” Oideas Gael is a great place…a wonderfully supportive environment for learning. Bhí mé in Oideas Gael an seachtain seo caite (Meitheamh 29th-Iúil 6th). Is breá liom an ceantar sin. D’fhoghlaim mé a lán gach lá.